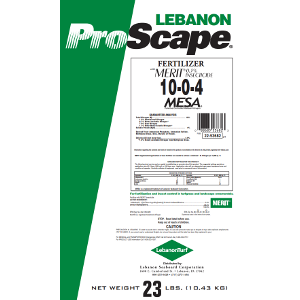 ProScape® 10-0-4 30% MESA® 0.3% Merit® provides plant nutrients as well as providing control of selected insect pests. This product can be used for the control of soil inhabiting pests of turfgrass, for example northern and southern masked chafers, Asiatic garden beetle, European chafer, Green June beetle, May or June beetles, Japanese beetle, Oriental beetle, sugarcane beetle, billbugs, annual bluegrass weevil, Black turfgrass ataenius, crane flies, and mole crickets. This product can be used as directed on turfgrass for example, in home lawns, business and office complexes, shopping complexes, multi-family residential complexes, golf courses, airports, cemeteries, parks, playgrounds, athletic fields and sod farms.